The longer answer (and also the reason I haven’t blogged about it), is yes. We are ttc again. And yes, we are crazy. The reason I haven’t mentioned it is because I wasn’t sure how to go about it and how certain people would react if we told them and I just wasn’t ready to talk about it. Does this mean I am going to be in your face with TTC updates? Nope. You can ask me questions if you want but I probably won’t bring it up too frequently on here, aside from a little mention here and there. I still have lots of readers who are dealing with primary and secondary infertility and I doubt very much that they want to hear me whine about PCOS and irregular cycles and TTC again. Tru has been asking for a “girl baby” so much lately and he’s been asking to pray at his bedtime for God to give us a girl baby. (If you remember, Tru was adamant that Zane would be a girl and seems to really have his heart set on having a sister.) Tru and Levi both point out all the baby girls that we see in public. I am happy either way and I know if we get a boy baby, a girl baby, or no baby that I am happy and at peace with what God has given us. I hope nobody reads this and thinks I am being greedy or anything. I know how blessed we have been. I think of it nearly every day of my life! We had originally planned on having 4 kids but whatever is God’s will is fine with me. *What I find even more shocking than the question is the fact that it doesn’t really bother me when people ask. Even though I find it kind of embarrassing for their sake. After the vast majority of social functions/parties etc, I find myself going over the conversations that I’ve had that day and analyzing the things I said. Did that person take what I said the right way? Did it come out wrong when I said that? Did I hurt their feelings? Could they have taken that the wrong way? …and on and on and on. It’s quite exhausting actually in that I often lose sleep over things, laying awake at night wondering if I said the wrong thing and now someone is going to think I’m weird (hello!) or that I’ve hurt them somehow. I find myself occasionally just pulling out of conversations because I’m too uncomfortable about the topic and I just know I’ll end up saying something that will come out wrong. For example: I have several relatives who are dealing with primary infertility and I never have an interaction with them where I’m not panicking afterwards about whether I’ve accidentally hurt their feelings or if they felt I was grateful enough for my kids etc. It’s so hard! 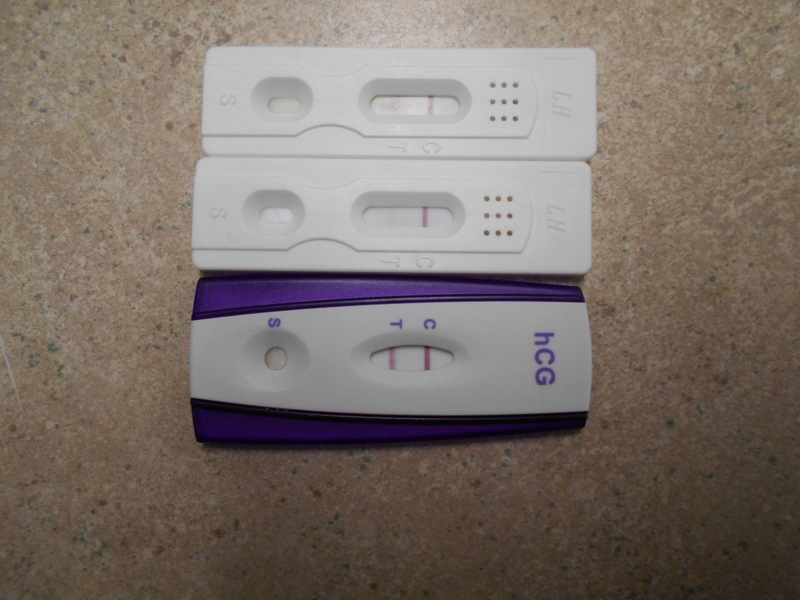 We were all dealing with infertility at the same time. Now I have biological kids. One of them has adopted a child and another is in the process of adopting. This makes me hugely excited for them but I know that in the joy of adoption, they still long for the experience of pregnancy and birth. I don’t know the balance of excitement but also support for the emotional side. And I also lack the finer etiquette on adoption lingo. I KNOW that these girls don’t hold it against me if I accidentally say something that isn’t PC about adoption etc. But the less rational side of my brain spends the entire rest of the day panicking that they’ve taken something the wrong way and I’ve hurt them. I worry about my interactions with my in-laws to a ridiculous extent. I ALWAYS assume I’ve said something stupid and upset them. I worry if I haven’t been 100% positive about DH etc that they will take it personally since he is their child/brother/nephew etc…. Ugh! So, is it just me laying awake at night going over every conversation and wishing I’d worded something differently or just not talked at all? 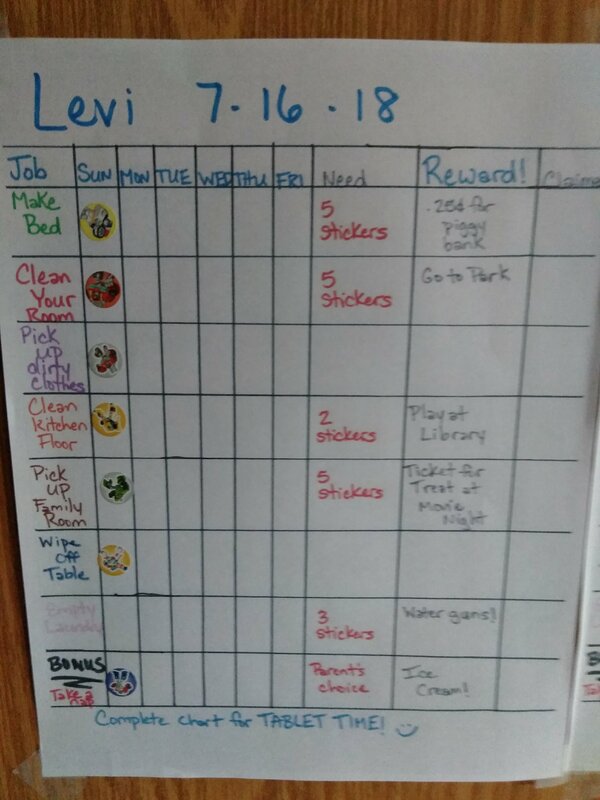 A couple months ago I came up with a list of chores for Truett and Levi to do and I designed a chore chart for them. Some of the chores need to be done daily but a couple of them are just as needed. 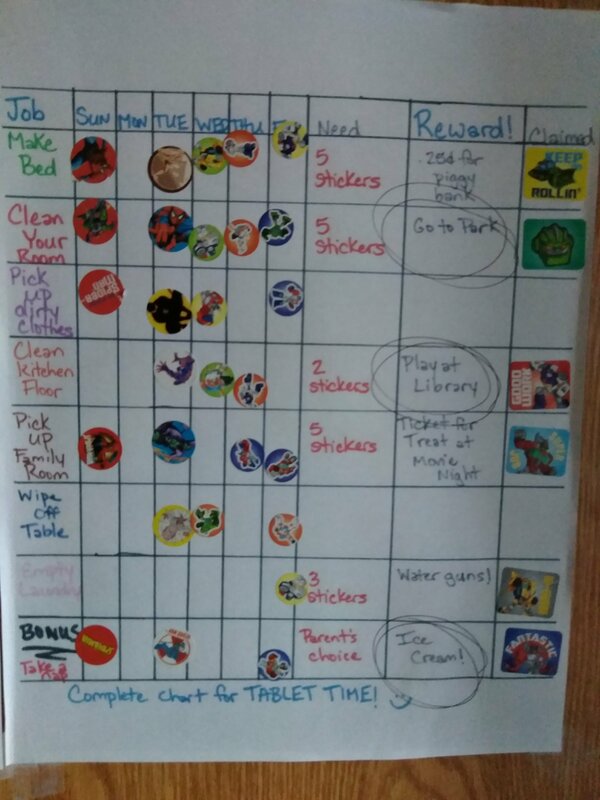 They love their chore charts and the fact that they get to put on a sticker for each completed task. At the end of the week they get a reward if they earn the minimum amount of stickers needed to redeem each reward. A completed chart earns a much longed after hour of tablet time. I love it because they are learning to be responisble and to pick up after themselves, but they are still having fun with it. And of course, the chores are only done to their level of ability. So, for example, they have to mop the kitchen floor. At their age that means I give them a bowl of water and a rag and they skate around on the kitchen floor and spill water everywhere (not a problem because we have linoleum). Then I go along after them with a drying towel and that is where the majority of the cleaning goes on. 😉 But they get to feel good about the job that they have done and they actually ask if they can please clean the floor now! Which is huge to me since we've been doing this chart for a couple months but they are still having fun with it! The other good thing is, we are working together and having fun at the same time. I know that some people say not to reward kids for various things but I think this is within reason. It's stuff that we would be doing anyway but now they have the satisfaction of earning it. I've never seen 2 kids more proud of themselves, carrying their little container of change into the store and buying their own toy that they picked out (A *transformer and they play with them constantly! Especially Truett.) Their combined savings of $1.80 really helped offset the $20 we spent in the toy section. 😂 Haha!! But I felt like it was a good lesson for them. It's so easy to spend someone elses' money but they were very particular about how they spent their own. They (again, especially Tru, because of his age) looked at all their options and weighed whether it was worth spending ALL of their money on before they made a choice. I've been workng on teaching them to save money in their piggy banks too when they get money for birthdays and Christmas etc, and they have done great with setting aside money and having spending money. So, this whole thing with learning to do chores has actually opened up a lot of learning opportunities in other areas. It's been really neat to see also how they have been more responsible in their playing to not just destroy the whole room, since they know they will be the ones cleaning up. They had gotten in the bad habit of dumping out so many toys and books and just creating chaos, then when I'd ask them to help pick up, they would whine that the mess was too big. Don't get me wrong, they still make big messes. But I see them think twice before just raining chaos on the house. DH and I celebrated our 10th anniversary yesterday. It’s hard to believe that we have been married a whole decade! What is even harder to believe is that we have been parents to our children here in the outside word less time than we were married without kids. I must say that the years we have been parents have been a lot more fun. Not that life before kids was less important but so much of that time was spent fighting infertility that it really stole the joy that we should have had as newlyweds. There is beauty for ashes though because these last 5 years have been so full of joy and sweetness that it totally makes up for the journey we went through. I know not everyone has the same outcome as we have had and that makes me all the more mindful to appreciate these little ones. I am so thankful for my husband who spoils me. I know that I don’t tell him often but his hard work for our family does not go overlooked by me. I appreciate all the sacrifices he’s made throughout the years and I am proud of the husband and father that he is now. Most of all I am thankful that God led us to each other. As young kids only 18 and 19 when we eloped, I can truly say that I didn’t fully grasp the magnitude of what marriage and commitment means. I was very immature at times and didn’t know how to love DH the way he deserved to be loved. But over the years our love has grown and we have matured together and I can honestly say that I love him more now than ever before. We may not have as much time to spend together now but the time that we do have is much more special to me. I could go on and on but I doubt anyone is interested in reading such a sappy post. 😉 Thank You God for my godly husband. Please bless and protect him. In Jesus’ name, amen. As if a foreshadowing of things to come, DH holding my little bro A. And me holding my little bro M.
On our recent vacation to California in May. Hello everyone! I was reading through some of my old posts yesterday from when Levi was a baby and I realized how much I loved looking back. I’ve forgotten so many things already… Things you think you’ll never forget. Like the first time Tru said “Love you” to me. It made me want to get back to blogging. I miss the online community that has been here for so many years (over 5 years, y’all!) while I documented the mundane happenings and all my thoughts and feelings along the way. I miss blogging and I want to get back to it! Yes, I have less time now than ever to sit down and write long detailed posts but I really need to be writing something!